Our babies are finally here! 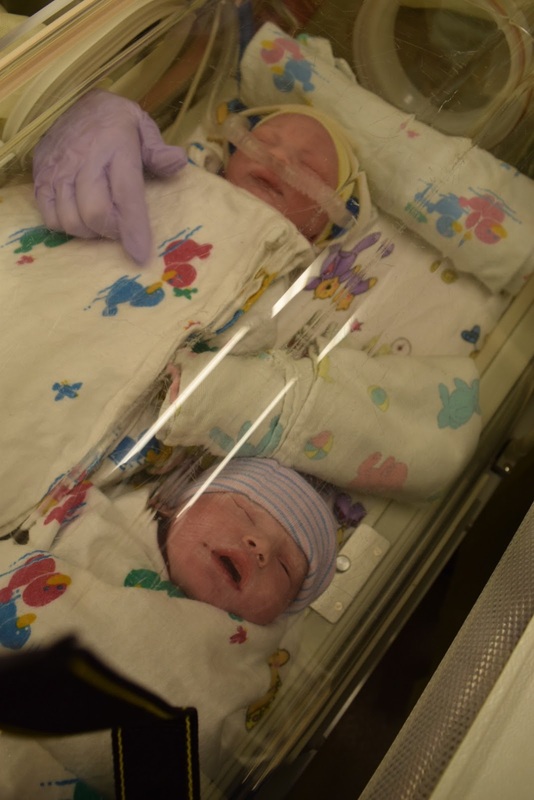 They were born December 30th at 1:08 and 1:09 AM. I was 36 wks and 4 days pregnant! 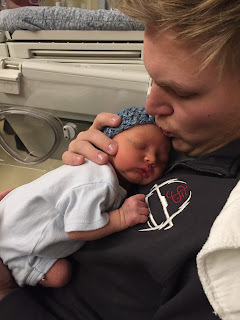 I want to tell you their entire story so I apologize for the length of this post in advance. It's quite the adventure. My itching got pretty bad Sunday, December 27th, so Monday morning we called in to the office and were told to go to labor and delivery triage at once. We geared up and packed our bags into the car, not knowing we wouldn't be home for about a week, and with 2 bundles of joy in tow. When we got there, they checked me in and started a series of exams. 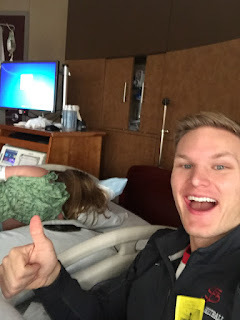 I wasn't having any huge contractions so I thought, "they're going to check me out, and send me home." The nurse came in next, started an IV and said, "I don't think they're going to send you home." Alex was still in the waiting room at this point. I was elated! I was going to meet them finally! Once they brought Alex back we were giddy with excitement and prepared to get admitted to a room in labor and delivery. Not much happened Monday. They checked my cervix. It was only dilated to a 1+ and was not "ripe" yet, meaning thin enough. So, they gave me a medication vaginally called Cytotec to induce labor. This started working but was incredibly slow. All the while contractions were picking up in intensity. Monday was a long day. Since this is a very painful process, the resident recommended I get my epidural first. So that's what we did. My epidural was placed at 1 AM on Tuesday by a resident I knew from working at KU, and he did an absolutely phenomenal job. I didn't even blink and it was in. This totally helped my pain but was one of the most bizarre feelings ever. My legs got really warm and then lost feeling... we knew it was working. Next, they placed a foley catheter for urine drainage followed by the cook catheter at 1:30 AM. 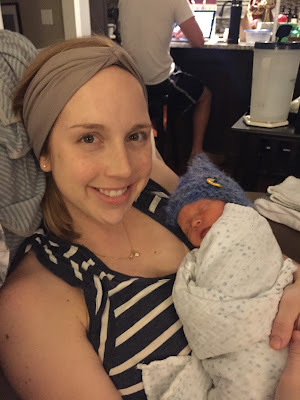 Even with the epidural, the entire process was incredibly uncomfortable. By this time, I was done having people touching me in the most painful area of my body- it was currently feeling like it was splitting in half. Pitocin was started at 3:50 AM and then the long, painful day began. After that, it was contraction after contraction, some only 1 minute apart and longer than a minute in intensity. I felt awful. Nothing happened all day Tuesday except very slow dilation and contractions. It was the longest day of my life. But Alex was AMAZING. I cannot emphasize that enough. He was there through every contraction, every procedure and every cervical check. I am in awe of how selfless this man is. Except all the pictures being taken, although now... I'm glad he did. They decided to check the babies positions again with ultasound. Bennett was still head down, way down and ready to go. Emmy was breech but since their weights were so similar, the plan was still to deliver vaginally. At 7 pm, the resident came in and was going to check me. I was a 4+ and so she broke my water. It happened so fast! I wasn't prepared for it. It felt like I was a deflated balloon. Immediately I felt the pressure of Bennett's head. Thirty minutes later, I was checked again and I was already a 5. 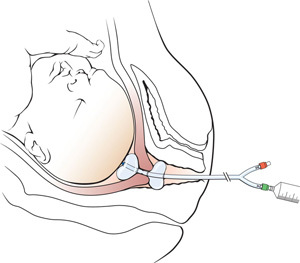 The pitocin was then stopped because of how fast and intense the contractions were getting. I remember shaking and crying and being terrified. I began having feelings of a strong bowel movement but not being able to move. I was told over and over this was normal. Normal or not, it felt awful. They kept checking me and I kept contracting. 7+, 8+, 9... It seemed slow to me but I know this all happened so fast. 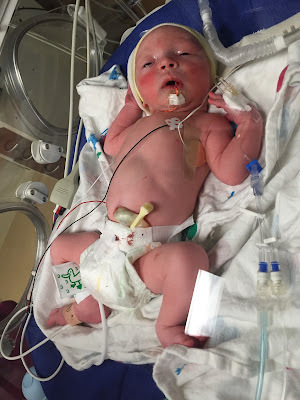 After an initial push in the room, I was transported to the Operating Room around 11:40. At KU, all multiples are delivered in the OR just incase they need to do a c-section. Alex and my mom were dressed in scrubs and hats and ready to meet the babes! I just kept breathing as best I could. I moved over to the bed with what little strength I could muster and started pushing right away. I pushed for an hour and a half. I felt like I was splitting in half. I felt that with every push I was gong to pass out. Being told to bear down but relax all other areas of your body was like being told to run as fast as you can but don't move your legs. IMPOSSIBLE. After that hour and a half, I noticed the people in the operating room getting nervous. I was completely outside my body and exhausted beyond belief. I couldn't hold my legs up at all and had nurses on either side of me supporting my body. Emmy's heart rate was dropping. Bennett was so difficult to push out because he was "sunnyside up". See picture below. 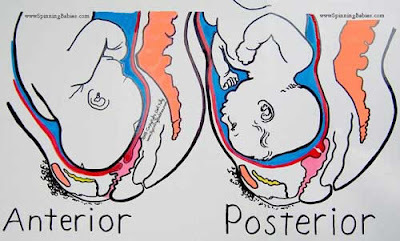 The left picture is how a baby is supposed to be born. Bennett was the right, poor little guy was just not fitting. The doctor kept me pushing. With every push I felt all my energy leaving and not returning. I felt like I was going no where fast. Emmy's heart rate continued to drop. It was as low as 60 at one point for more than 6 minutes. A fetal heartbeat is supposed to be 110-180. I could see my doctor getting nervous. I started crying more and my body started shaking uncontrollably. A nurse held my hand the entire time and stayed with me, talking to me and trying to calm me down. Before I knew it, they yelled prep for emergent c-section. My mom and Alex were rushed out of the room just before 1 AM and I could feel myself being positioned for surgery. I was screaming for them to put me under... it seemed to be taking forever. Everyone was rushing around. All I remember thinking was "Oh my God, I could lose a baby." Three more anesthesiologists came in. Since I work in surgery, I've been around emergent cases and have done them myself. Being the patient was a whole different story. I was awake the entire time and could feel my legs almost falling off the table. I remember yelling that they were about to fall and the doctor was trying to get someone to position my legs. I knew the long term consequences of poor positioning. The most terrifying thing for me was the splash prep. It happened so fast. Down went the drape and up stepped the doctor and resident. I was still crying hysterically and prayed they had taken my mom and Alex out of the room. The resident looked down at me and asked if I could feel the knife. I said no, and she began. Then I felt a huge push on my stomach and minutes later I heard them say both babies were out. I didn't hear any crying at first, a scare I hope no mother has to endure. Then I heard Emmy. As they were sewing me up, I remember someone bringing her to me so I could kiss her and then she was whisked away. I never saw Bennett. Both were taken to the NICU immediately. I heard later they were brought right by the waiting room so our family could see them for a moment. Sharing an isolette on their first trip in this world. I love them so much. Alex went with them straight into the NICU. Someone later told me I was pretty funny after all the meds I as given. I asked the doctor what they were doing now and when she replied sewing up your uterus I responded "Thank you so much." I guess my manners have no effects by medications. Makes me laugh. I was wheeled to recovery and my mom came back after I was stabilized. Alex then returned from the NICU with video of the babies so I could see them for the first time! I was in so much pain but seeing them cry and alive was the most amazing experience, even if it was on his phone. Here is Bennett, all hooked up and getting checked out. 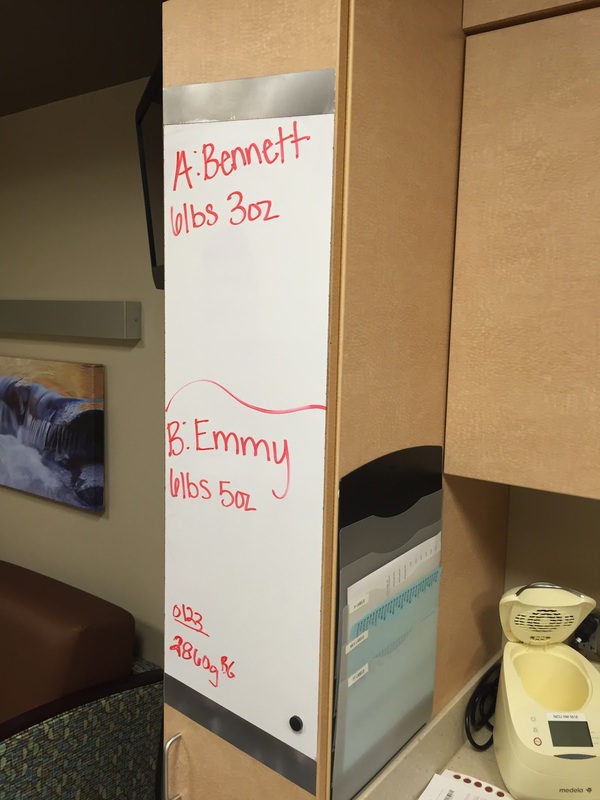 Bennett was born first at 1:08 AM weighing 6lb 3 oz followed by Emmy Lou at 1:09 AM weighing 6lb 5 oz. Both babies were 20 inches long. It's a twin thing. 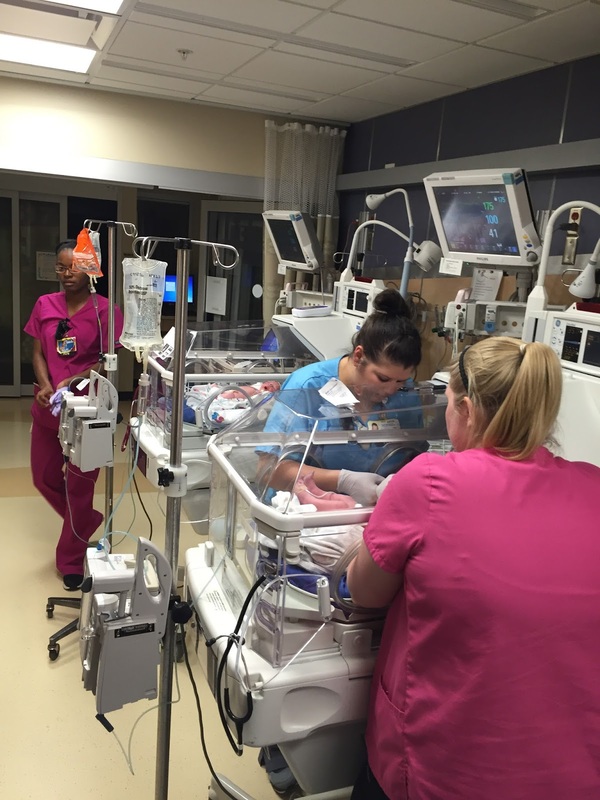 Alex told me there were about 8-10 nurses/ medical staff in their NICU room. These people were life savers. I am speechless at the care they took of our babies. Incredible. When Alex came to recovery, I could see fear in his eyes. I'm sure I was as pale as a ghost, having lost a liter of blood. A PCA of morphine (pain pump) was started and I was given ice chips. After two hours of recovery, I was ready to go to my room in Mother Baby. The pain was still intense throughout my abdomen. First we stopped off at the NICU so I could see a glimpse of the babes. I wasn't able to hold them, or even get out of the bed but I finally got to see them. I felt sick and we headed to the room to try and get some sleep. At this point it's about 5:30 AM and we are EXHAUSTED. The next day, I woke up in so much pain but was too eager to meet and hold the babies I didn't seem to mind. Alex helped me get over to the NICU and we finally got to hold them, even though they were hooked up to what seemed to be hundreds of monitors. I looked rough but I didn't care- I was meeting the babies!!! PROUD parents of these strong babes. 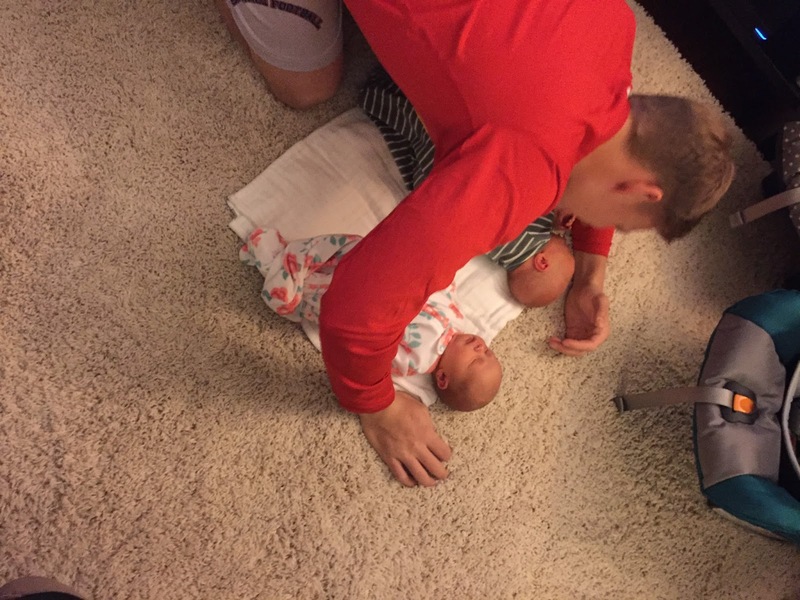 Holding the babies for the first time... absolutely breathtaking. Like Father Like Son- takes my breath away. I didn't want to leave them ever. But I had to make my way back and forth from Mother/ Baby to the NICU because I needed to get my pain under control. The nurses on both units were BEYOND amazing and catered to our every need. They supported us, taught us, and stayed with us 24/7. I have nothing but the utmost respect for all of the medical staff that helped us through the stay. 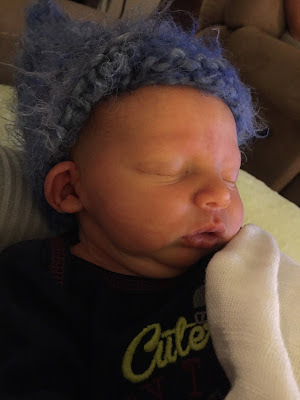 We began the feeding regimen of every 3 hours, which was rigorous... especially with my incision site burning, pulling and reminding me of the terrifying delivery just days before. Lactation visited with us many times and eventually I was tandem feeding them, which means breast feeding them at the same time. This seemed to save us 45 minutes each time. Alex and I were exhausted but we could see improvements in the babies almost every hour which made it all worth it. The babies lost weight in the NICU as most babies do. 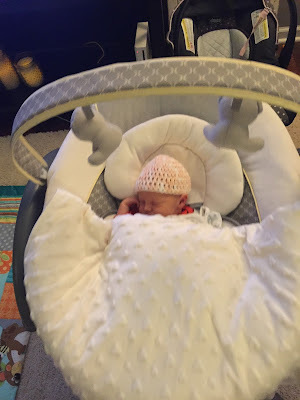 They got down to 5 lb 14 oz and 5 lb 15 oz so we were told weight gain and blood sugar control were the most important, as well as keeping them warm so they didn't loose any more weight. They were weaned off their IV fluids, they learned how to feed, graduated from isolettes to open cribs. 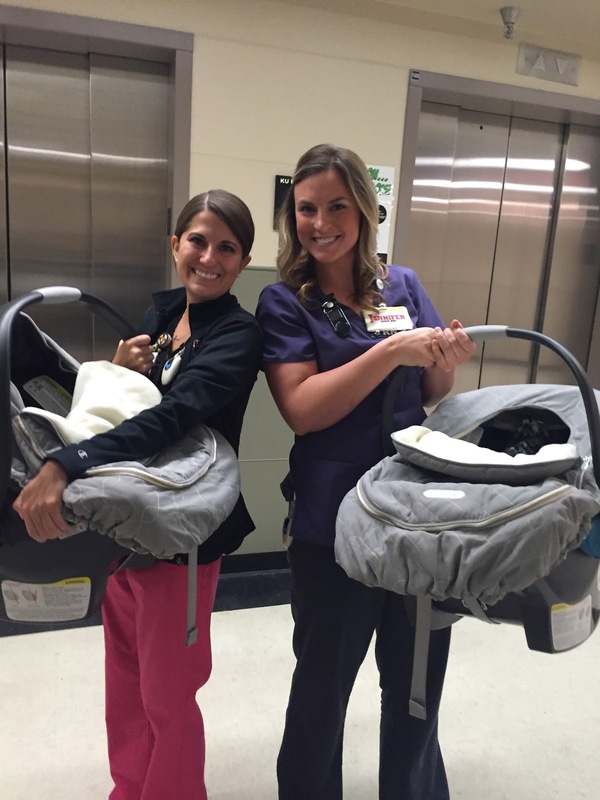 They were the ideal patients in the NICU. They met all their grandparents, one side's great grandparents, aunts and uncles and snuggled with anyone that would visit. 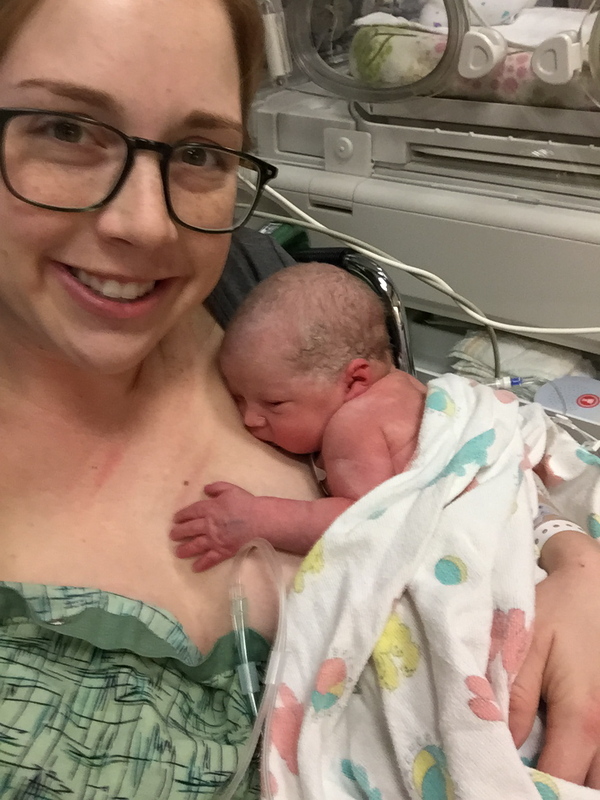 I was discharged from Mother/ Baby on Saturday January 2nd around noon and the babies were on track to go home the next day. 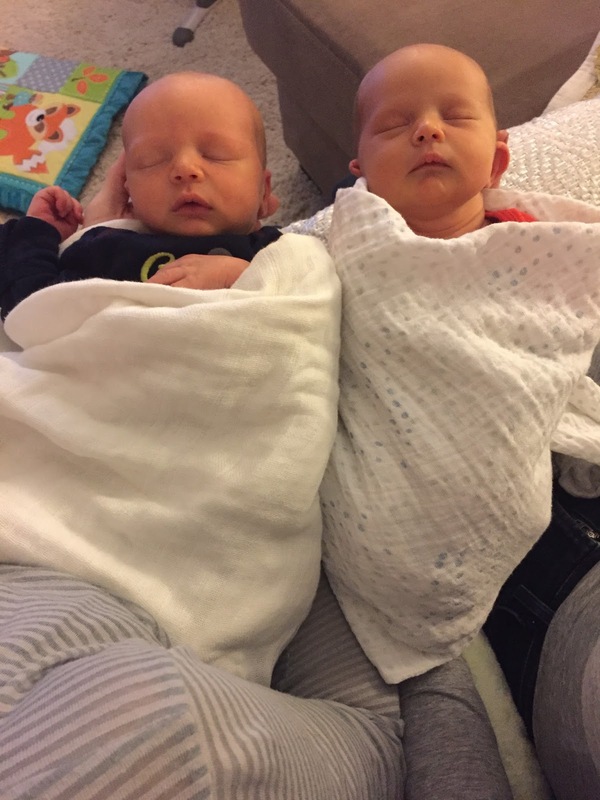 Alex and I spent one night in the NICU and immediately realized how lucky we were that our babies spent less than a week in the NICU. We met a woman who's son was born at 24 weeks and she had been there since October. We ate lunch with her and all I could do was hope and pray she gets to leave with her baby sooner rather than later. 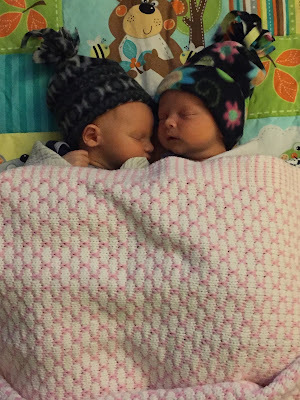 We were discharged with the babes the next day around noon and have LOVED being home with them. They add such light to our lives. Our help to our car- we are home FREE! Sir Bennett, catching some Zzzz's... Newborns sleep upwards of 20 hours a DAY! Little Emmy, loving her swing... Thanks CVOR fam! I realize now that wishing my babies to come sooner than the time they came, was foolish of me. I was miserable being pregnant but seeing them now, I couldn't have imagined them being any smaller or less developed. I feel irresponsible and can't tell you how thankful I am my body did hold out until 36 weeks. Thank you all for the prayers and thoughts, texts and calls. You have made this journey easier on my family and I. Most parents say that the greatest days of their lives are the days their children were born. Mine sure did not start off that way. To be completely honest I have never been more scared in my entire life. I wasn't scared of having kids, or bringing them home, or raising them, or the crazy amount of responsibility that comes with starting a family. I was ready for all that. I have been ready for all that for some time now. The night of the twins birth did not go as planned at all. After watching Lauren labor away for what seamed like an eternity, I was relieved when I finally got to throw on the scrubs and we went into the operating room. After Lauren had pushed to the point of exhaustion I started to hear the doctors and nurses talk about Emmy's heart rate. I was splitting my time cheering on Lauren and watching the fetal monitor to see if Emmy's heart rate would improve. Five minutes went by with Emmy's heart rate dipping down below half of what it should be and the doctors were getting nervous. This obviously only escalated my fears and anxieties. The doctor made her decision and with it came the time that the nurses asked Lauren's mom (Heidi) and I to leave the room. Through my mask I gave lauren one last kiss on the forehead before leaving. Heidi and I waited outside the operating room. The doctor rushed outside to scrub and get ready for emergency surgery. As the door closed behind her I could only hear the screams of Lauren as she went through pain I can't even imagine. I froze. Every bit of me froze. I couldn't think, I couldn't move, I couldn't pray. Finally my mind went only to the worst. What if something happened to Lauren? What if something happened to the babies? Next Heidi grabbed me through my tears, and did for me something I could probably never repay her for. She prayed. She prayed for me because I couldn't find the words to say. She calmed me down, this got my mind thinking right. She snapped me back into reality. Not 10 minutes went by before a nurse came to find us. She started by saying that the twins were born but there were some complications with Bennett's breathing. She also said Emmy was fine but didn't specify on Lauren before she quickly returned to the room. I had a knot in my stomach for Bennett but also for Lauren's well being. Lauren and I had previously made a deal that I would go with the babies if they had to go to the NICU. So I went to the NICU. I was there in daze. I was suppose to be overjoyed with heart more full that it has ever been. But to be honest I was there with only half of my heart. The other half was left back in the operation room, worried about Lauren. In that little NICU room I watched as 8 nurses work on our tiny babies. I asked about 1,000 questions and they were all answered by some of the most caring, professional people I have met in health care. I spent about an hour there then needed to go back and be with Lauren. I met her in Recovery. There she was. The strongest woman I have ever met on her throne of victory. 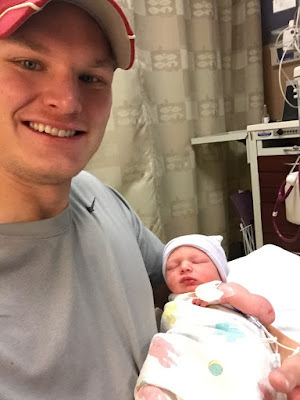 Sure it was an uncomfortable hospital bed, and Lauren was completely exhausted but she met me with a smile and only one question, "How are the babies?" I told her and I showed her pictures and videos. We sat in that bright room and cried together and this was the moment. This was the moment my heart was bigger than it had ever been before. This was the moment that December 30th became the best day of my life. I know I have gone on too long and I want to thank Lauren for letting me write on her blog. And a personal note, thanks for reading Lauren's blog. She works so hard on it and I love seeing her as she receives feedback and support. Tearing up through the ups and downs of that day... What an absolutely perfect happy ending. God is good! Thanks for sharing Lauren & Alex. It made my day. What a beautiful story. Tears of joy for you both and those blessed babies!!! Thanks so much for sharing!! !